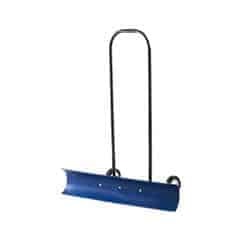 The Snow Pusher we carry is affordable, durable, eco-friendly, and incredibly easy to use. It is also made in the USA, and backed with a full one-year warranty by the manufacturer. This snow pusher is engineered and manufactured with commercial applications in mind. Product engineering and material selection with commercial applications in mind. Reduces fatigue, easy on your back – no lifting. Blade constructed of glass filled impact modified PP resin. Bracket is molded from impact modified nylon. Angled 36″ Blade for “windrowing” snow. Handle is constructed of galvanized steel with a durable powder coat finish. See the Snowcaster 30SNC model we carry in action! It blows away traditional snow shovels for speed and ease of use.